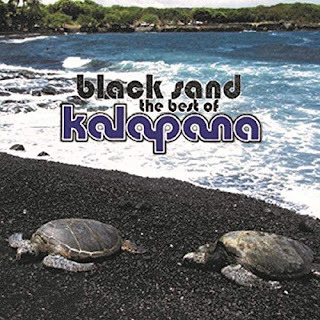 One of Hawaii's best kept musical secrets is the soft rock band, Kalapana. Their career has stretched on for 45 years, and on November 30th, Manifesto Records is releasing an extensive 9-CD box set containing the band's first seven albums, plus a couple previously unreleased albums here in the U.S. Also, on that same date, a more concise 20-track greatest hits set titled "Black Sand, The Best of Kalapana" is being released. This 20-song set begins with two of Kalapana's mid-seventies hit singles "The Hurt" and "Naturally," both from the band's debut album. The band kept that winning soft rock recipe flowing through their next couple albums with songs like, "Dorothy Louise," "Moon And Stars," "Songbird" and "Alisa Lovely." This compilation also gives you a taste of Kalapana in a live setting with a couple of tracks ("Inarajan" and "Girl") from their "In Concert" album. Also included in this set are some songs from their Japan only releases, "Northbound" and "Hold On." The real treasures are the previously unreleased (in the U.S.) songs "How Does It Feel" and "Northbound," which showcase a more rocking version of Kalapana's music. To find out more about these two new great sets from the Hawaiian band, Kalapana, please visit manifesto.com/kalapana.